The legend of the founding of the Kelmendi tribe in the mountains of northern Albania is preserved, in one version, by the German scholar Johann Georg von Hahn who heard it from a Father Gabriel in Shkodra in 1850. Translated from the German by Robert Elsie. Many years ago, there was a rich herdsman in the region of Triepshi. A young man of unknown origin, called Klement, came by and was employed by the herdsman to take care of his sheep. This the shepherd did together with the herdsman’s daughter who was called Bubci. She was lame and had thus not been able to find a husband. With time, their friendship developed into a love affair and the maiden became pregnant. When the girl’s mother found out what had happened, she used all the means at her disposal to persuade her rough and heartless husband not to punish the young couple but to allow them to live together. According to custom, he had the right to put them to death. In the end, she succeeded and Klement and Bubci became man and wife. They were given twenty head of livestock and were sent to another mountain region where they were to settle because the old man could not get over the shame on his family caused by their affair. The mountain area that the new couple received and where they settled was called Bestana. Even today one can see the remains of a small church, a few houses and some overgrown grapevines there. It is said that the place had to be abandoned because of the great number of vipers that still exist there. Bestana is situated about four hours from the villages of Selca and Vukël. The land in that area, as the home of their ancestral father, was never apportioned to any tribe members and thus belongs to all of the Kelmendi tribe. With Bubci, Klement had seven sons. With time, they became the ancestral fathers of the seven largest families that founded the villages of Selca, Vukël, Nikç, Vusanje [Vuthaj] and Martinovići [Martinaj], whence the Kelmendi of Bukova in Dukagjin and of Llap in the mountains of Kosovo stem. The eldest son was called Kola and was the head of the village of Selca. He had three sons: Vui Kola, Mai Kola and Rabin Kola. The three families that descended from these men formed the population of Selca that now has 350 households and 1,600 souls. The second son was called Vuco. He had only one son called Deda (which is the equivalent of Italian Domenico). Deda, in turn, had three sons: Uhsai Deda, Giz Deda and Zek (i.e. Joseph) Deda, whose families now make up the village of Vukël that, together with the earlier inhabitants has 170 households and 1,300 souls. The earlier inhabitants are the last remaining representatives of the original population of the region who, according to legend, were mostly driven out by the Kelmendi. They formed the Gimaj, Pepusaj and Xhireaj families. The Albanians call them the Anes (from Albanian anë ‘side, edge’), i.e. people who were outside of the ruling tribe. The third son was called Nika. He had several sons, among whom were Del Nika, Bala Nika and Untha [Vuth] Nika. Del Nika and his descendants founded the village of Nikç that now has 75 households and 500 souls. The two other brothers, Bala and Untha, left Del. They took over the pass between the Prokletije and Plava mountains and built the village of Unthaj [Vuthaj] that is situated half an hour south of the town of Gusinje [Gucia] and six hours north of Selca and now has 70 households and 500 souls. The other sons of the ancestral father Klement were also blessed with many children so that the tribe flourished rapidly and counted many valiant men. Since the Albanian race is inclined, by nature, to warfare and blood feuding, the Kelmendi were never satisfied with the simple lives of shepherds, but rather indulged in robbery whenever they had the chance. As the strength of their tribe grew, they extended their attacks more and more into neighbouring territories and even managed to force the region between Gucia, Pester [Pešter] and Pekia [Peja] into submission. These raids and conquests meant that the Kelmendi were constantly involved in warfare with the Ottomans. Three major wars are recorded by tradition: one with Shkodra, one with Podgorica and one with Peja. The first one is said to have lasted ten years, and in one sole confrontation, no less than 10,000 Turks lost their lives. During this war, the Kelmendi withdrew to a natural fortress called Samo Gradi which was also known as the ‘Fortress of Kelmendi’ (forcë e Kelmendit). 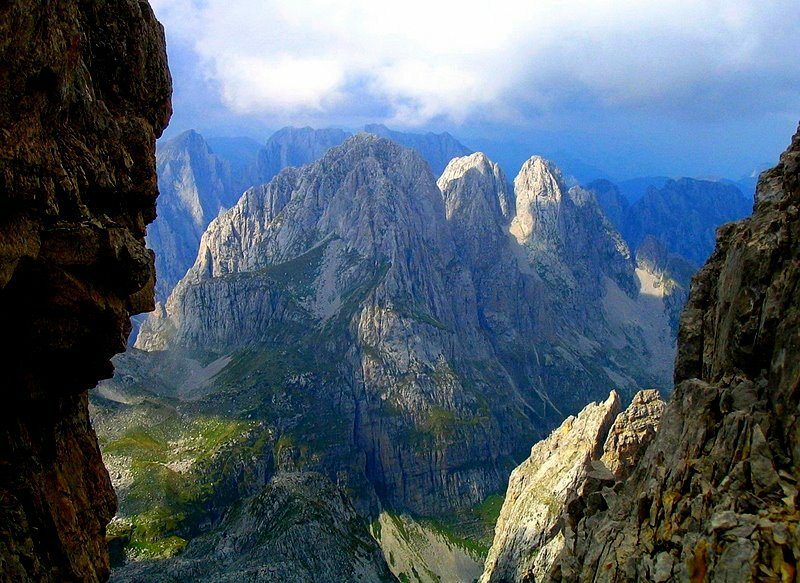 It is a small plateau in the Prokletije mountain range, about half an hour in circumference. It is surrounded on all sides by unassailable cliffs and has only one entrance that is extremely difficult to approach and easy to defend. In the midst of the fortress there is a spring of ice-cold water that never goes dry. On the southern side is a large cave that serves to house the women, children and the few domestic animals they take with them. Since they were often besieged in this refuge by their foes, they suffered much, including periods of starvation when they were often forced to eat the bark of the trees. When the sieges subsided or when they succeeded in outwitting or getting around the enemy positions, the highlanders took revenge in gruesome attacks in the surroundings and always managed to return with food and booty. The second war was with Podgorica and lasted seven years. It was no less brutal than the first one because the suffering that the Kelmendi went through in this war was so great that, in seven years, only three boys were born in the village of Selca and they turned out to be weak and sickly. In the third war against the Pasha of Peja, the Kelmendi were initially lucky and managed to block the Turks in the fortress of Gucia. At that time they made use of portable shield-like baskets that they filled with wool and held in front of them as they advanced over the plain. These baskets protected them from the view of enemy artillery and enabled them to reach the besieged Turks with their long rifles, and wreak great destruction. They were so sure of victory that the chiefs of the various families began to divide up the enemy territory among themselves. However, a dispute arose during their discussions with regard to certain pasturelands and one of the leaders called Chiobala became so bitter in his unsuccessful endeavour to stake a claim that he betrayed his tribe. During the night, he made contact with the Turks and, in exchange for a promise to be given the pastureland in question, revealed a means by which the Turks could overcome the advance of Kelmendi forces. The Turks followed his advice and, that same night, planted a lot of small stakes in the ground where the Kelmendi usually attacked with their baskets. The next morning, when the Kelmendi realised that they were unable to move their protective baskets freely because of the stakes, they panicked, took flight into their mountains and were pursued by the besieged Turks. From that time on, the war took a bad turn for the Kelmendi and most of them were subsequently forced to emigrate. They had probably become too numerous to survive in the arid mountain regions they inhabited anyway. It is from the time of this war that we can date the emigration of the Kelmendi to Rugova above Peja, to the mountains of Lap-Gulap [Llap-Gollak] in Kosovo, to Selca (Slavic Seoca) on the eastern bank of Lake Shkodra, to the border of Montenegro, and finally to Syrmia where, under the name of Clementines, they still inhabit the villages of Ninkinci and Hrtkovci. Of those who remained on their tribal land, two colonies later emerged. One settled south of the valley of Kelmendi between the Prokletije and Biskachi mountains and built the village of Boga that now has 40 households and about 400 souls and a banner [bajrak] of its own. The other colony went north and built the village of Martinaj on the eastern bank of the Lim River, half an hour from the place where it flows into Lake Plava. The inhabitants of this village converted to Islam, as did their neighbours and fellow tribesmen from the above-mentioned village of Vuthaj. Extract from Johann Georg von Hahn, Albanesische Studien (Vienna 1854), vol. 1, p. 183-185. Translated from the German by Robert Elsie.